New research in the field of age-related macular degeneration (AMD) may be giving stem cell therapy a chance to move into the next level through a clinical trial that may be the first of its kind. The work, published in a paper titled, “Clinical-grade stem cell–derived retinal pigment epithelium patch rescues retinal degeneration in rodents and pigs” was published in Science Translational Medicine on January 16. 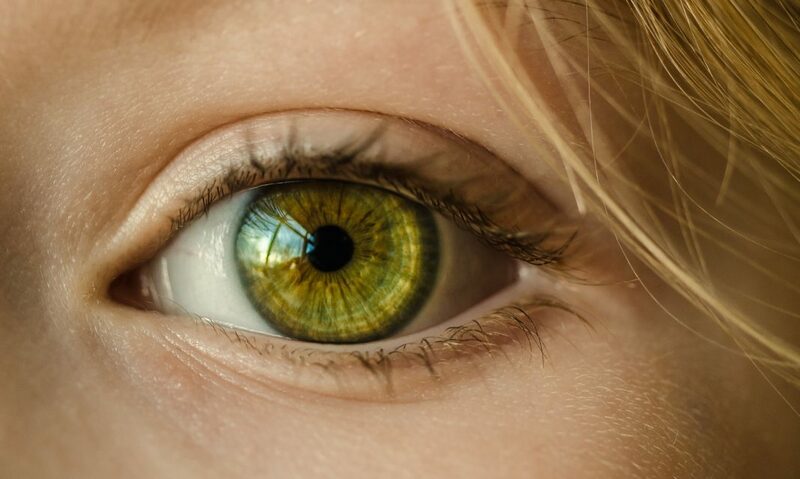 Using a novel patient-specific stem cell-based therapy, researchers at the National Eye Institute (NEI) prevented blindness in animal models of geographic atrophy, the advanced “dry” form of AMD, which is a leading cause of vision loss among people age 65 and older. The protocols established by the animal study set the stage for a first-in-human clinical trial testing the therapy in people with geographic atrophy, for which there is currently no treatment. “If the clinical trial moves forward, it would be the first ever to test a stem cell-based therapy,” said Kapil Bharti, PhD, Stadtman investigator at the NEI unit on ocular and stem cell translational research. The therapy involves taking a patient’s blood cells and, in a lab, converting them into iPS cells, which are programmed to become RPE cells, the type of cell that dies early in the geographic atrophy stage of macular degeneration. RPE cells nurture photoreceptors, the light-sensing cells in the retina. In geographic atrophy, once RPE cells die, photoreceptors eventually also die, resulting in blindness. The therapy is an attempt to shore up the health of remaining photoreceptors by replacing dying RPE with iPSC-derived RPE. Before they are transplanted, the iPSC-derived RPE are grown in tiny sheets one cell thick, replicating their natural structure within the eye. 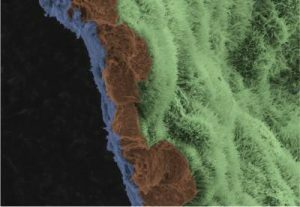 This monolayer of iPSC-derived RPE is grown on a biodegradable scaffold designed to promote the integration of the cells within the retina. A specially designed surgical tool was built for the task of inserting the patch of cells between the RPE and the photoreceptors. A scanning electron micrograph image shows a polarized RPE monolayer on a biodegradable scaffold. The image is colored to highlight the scaffold in blue, three RPE cells (brown), and the apical process of cells in RPE monolayer are light green. One concern about using iPSCs is the possibility of oncogenic mutations that might occur during the cell reprogramming process. In this paper, Ruchi Sharma, PhD, and colleagues at the NEI used CD34+ peripheral blood cells from patients with AMD to generate oncogenic mutation-free clinical-grade iPSCs from three AMD patients. These cells were then used for the production of clinical-grade RPE cell patches. The authors wrote that, “compared to RPE cells in suspension, our biodegradable scaffold approach improved integration and functionality of RPE patches in rats and in a porcine laser-induced RPE injury model that mimics AMD-like eye conditions.” For decades now, stem cells have held the promise of a cure. The transplantation of the RPE patches in rodent and pig models of retinal degeneration showed therapeutic effects. Immunostaining confirmed that the iPSC-derived RPE expressed the gene RPE65, suggesting the lab-made cells had reached a crucial stage of maturity necessary to maintain photoreceptor health. RPE65 is necessary for the regeneration of visual pigment within the photoreceptors and is an essential component for vision. Further tests showed that the transplanted RPE cells were pruning photoreceptors via phagocytosis, another RPE function that helps keep photoreceptors healthy. In addition, electrical responses recorded from photoreceptors rescued by RPE patches were normal; whereas photoreceptors treated with a control empty scaffold had died. For decades now, stem cells have held the promise of a cure. The authors suggested that the production process presented in this paper might accelerate the development of safer iPSC-derived stem cell therapies. The planning of a Phase I clinical trial testing the safety of the iPSC-based therapy for geographic atrophy is underway and will be initiated after U.S. FDA approval.